An integrated circuit, commonly referred to as an IC, is a microscopic array of electronic circuits and components that has been diffused or implanted onto the surface of a single crystal, or chip, of semiconducting material such as silicon. It is called an integrated circuit because the components, circuits, and base material are all made together, or integrated, out of a single piece of silicon, as opposed to a discrete circuit in which the components are made separately from different materials and assembled later. ICs range in complexity from simple logic modules and amplifiers to complete microcomputers containing millions of elements. The impact of integrated circuits on our lives has been enormous. ICs have become the principal components of almost all electronic devices. These miniature circuits have demonstrated low cost, high reliability, low power requirements, and high processing speeds compared to the vacuum tubes and transistors which preceded them. Integrated circuit microcomputers are now used as controllers in equipment such as machine tools, vehicle operating systems, and other applications where hydraulic, pneumatic, or mechanical controls were previously used. Because IC microcomputers are smaller and more versatile than previous control mechanisms, they allow the equipment to respond to a wider range of input and produce a wider range of output. They can also be reprogrammed without having to redesign the control circuitry. Integrated circuit microcomputers are so inexpensive they are even found in children's electronic toys. The first integrated circuits were created in the late 1950s in response to a demand from the military for miniaturized electronics to be used in missile control systems. At the time, transistors and printed circuit boards were the state-of-the-art electronic technology. Although transistors made many new electronic applications possible, engineers were still unable to make a small enough package for the large number of components and circuits required in complex devices like sophisticated control systems and handheld programmable calculators. Several companies were in competition to produce a breakthrough in miniaturized electronics, and their development efforts were so close that there is some question as to which company actually produced the first IC. In fact, when the integrated circuit was finally patented in 1959, the patent was awarded jointly to two individuals working separately at two different companies. After the invention of the IC in 1959, the number of components and circuits that could be incorporated into a single chip doubled every year for several years. The first integrated circuits contained only up to a dozen components. The process that produced these early ICs was known as small scale integration, or SSI. By the mid-1960s, medium scale integration, MSI, produced ICs with hundreds of components. This was followed by large scale integration techniques, or LSI, which produced ICs with thousands of components and made the first microcomputers possible. The first microcomputer chip, often called a microprocessor, was developed by Intel Corporation in 1969. It went into commercial production in 1971 as the Intel 4004. Intel introduced their 8088 chip in 1979, followed by the Intel 80286, 80386, and 80486. In the late 1980s and early 1990s, the designations 286, 386, and 486 were well known to computer users as reflecting increasing levels of computing power and speed. Intel's Pentium chip is the latest in this series and reflects an even higher level. In an integrated circuit, electronic components such as resistors, capacitors, diodes, and transistors are formed directly onto the surface of a silicon crystal. The process of manufacturing an integrated circuit will make more sense if one first understands some of the basics of how these components are formed. Even before the first IC was developed, it was known that common electronic components could be made from silicon. The question was how to make them, and the connecting circuits, from the same piece of silicon? The solution was to alter, or dope, the chemical composition of tiny areas on the silicon crystal surface by adding other chemicals, called dopants. Some dopants bond with the silicon to produce regions where the dopant atoms have one electron they can give up. These are called N regions. Other dopants bond with the silicon to produce regions where the dopant atoms have room to take one electron. These are called P regions. When a P region touches an N region, the boundary between them is referred to as a PN junction. This boundary is only 0.000004 inches (0.0001 cm) wide, but is crucial to the operation of integrated circuit components. Within a PN junction, the atoms of the two regions bond in such a manner as to create a third region, called a depletion region, in which the P dopant atoms capture all the N dopant extra electrons, thus depleting them. One of the phenomena that results is that a positive voltage applied to the P region can cause an electrical current to flow through the junction into the N region, but a similar positive voltage applied to the N region will result in little or no current flowing through the junction back into the P region. This ability of a PN junction to either conduct or insulate depending on which side the voltage is applied can be used to form integrated circuit components that direct and control current flows in the same manner as diodes and transistors. A diode, for example, is simply a single PN junction. By altering the amount and types of dopants and changing the shapes and relative placements of P and N regions, integrated circuit components that emulate the functions of resistors and capacitors can be also be formed. Some integrated circuits can be considered standard, off-the-shelf items. Once designed, there is no further design work required. Examples of standard ICs would include voltage regulators, amplifiers, analog switches, and analog-to-digital or digital-to-analog converters. These ICs are usually sold to other companies who incorporate them into printed circuit boards for various electronic products. Other integrated circuits are unique and require extensive design work. An example would be a new microprocessor for computers. This design work may require research and development of new materials and new manufacturing techniques to achieve the final design. Pure silicon is the basis for most integrated circuits. It provides the base, or substrate for the entire chip and is chemically doped to provide the N and P regions that make up the integrated circuit components. The silicon must be so pure that only one out of every ten billion atoms can be an impurity. This would be the equivalent of one grain of sugar in ten buckets of sand. Silicon dioxide is used as an insulator and as a dielectric material in IC capacitors. Typical N-type dopants include phosphorus and arsenic. Boron and gallium are typical P-type dopants. Aluminum is commonly used as a connector between the various IC components. The thin wire leads from the integrated circuit chip to its mounting package may be aluminum or gold. The mounting package itself may be made from ceramic or plastic materials. Hundreds of integrated circuits are made at the same time on a single, thin slice of silicon and are then cut apart into individual IC chips. The manufacturing process takes place in a tightly controlled environment known as a clean room where the air is filtered to remove foreign particles. The few equipment operators in the room wear lint-free garments, gloves, and coverings for their heads and feet. Since some IC components are sensitive to certain frequencies of light, even the light sources are filtered. Although manufacturing processes may vary depending on the integrated circuit being made, the following process is typical. 1 A cylindrical ingot of silicon about 1.5 to 4.0 inches (3.8 to 10.2 cm) in diameter is held vertically inside a vacuum chamber with a high-temperature heating coil encircling it. Starting at the top of the cylinder, the silicon is heated to its melting point of about 2550°F (1400°C). To avoid contamination, the heated region is contained only by the surface tension of the molten silicon. As the region melts, any impurities in the silicon become mobile. The heating coil is slowly moved down the length of the cylinder, and the impurities are carried along with the melted region. When the heating coil reaches the bottom, almost all of the impurities have been swept along and are concentrated there. The bottom is then sliced off, leaving a cylindrical ingot of purified silicon. 2 A thin, round wafer of silicon is cut off the ingot using a precise cutting machine called a wafer slicer. Each slice is about 0.01 to 0.025 inches (0.004 to 0.01 cm) thick. The surface on which the integrated circuits are to be formed is polished. 3 The surfaces of the wafer are coated with a layer of silicon dioxide to form an insulating base and to prevent any oxidation of the silicon which would cause impurities. The silicon dioxide is formed by subjecting the wafer to superheated steam at about 1830°F (1000°C) under several atmospheres of pressure to allow the oxygen in the water vapor to react with the silicon. Controlling the temperature and length of exposure controls the thickness of the silicon dioxide layer. 4 The complex and interconnected design of the circuits and components is prepared in a process similar to that used to make printed circuit boards. For ICs, however, the dimensions are much smaller and there are many layers superimposed on top of each other. The design of each layer is prepared on a computer-aided drafting machine, and the image is made into a mask which will be optically reduced and transferred to the surface of the wafer. The mask is opaque in certain areas and clear in others. It has the images for all of the several hundred integrated circuits to be formed on the wafer. 5 A drop of photoresist material is placed in the center of the silicon wafer, and the wafer is spun rapidly to distribute the photoresist over the entire surface. The photoresist is then baked to remove the solvent. 6 The coated wafer is then placed under the first layer mask and irradiated with light. Because the spaces between circuits and components are so small, ultraviolet light with a very short wavelength is used to squeeze through the tiny clear areas on the mask. Beams of electrons or x-rays are also sometimes used to irradiate the photoresist. 7 The mask is removed and portions of the photoresist are dissolved. If a positive photoresist was used, then the areas that were irradiated will be dissolved. If a negative photoresist was used, then the areas that were irradiated will remain. The uncovered areas are then either chemically etched to open up a layer or are subjected to chemical doping to create a layer of P or N regions. about 1500-2200°F (816-1205°C), and the dopant chemical is carried in on an inert gas. 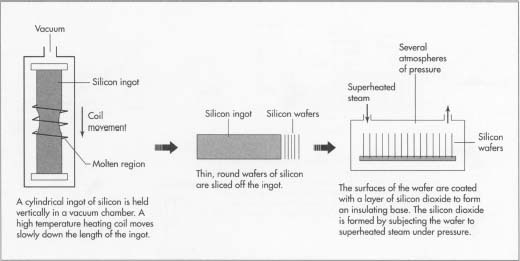 As the dopant and gas pass over the wafers, the dopant is deposited on the hot surfaces left exposed by the masking process. This method is good for doping relatively large areas, but is not accurate for smaller areas. There are also some problems with the repeated use of high temperatures as successive layers are added. 9 The second method to add dopants is ion implantation. In this method a dopant gas, like phosphine or boron trichloride, is ionized to provide a beam of high-energy dopant ions which are fired at specific regions of the wafer. The ions penetrate the wafer and remain implanted. The depth of penetration can be controlled by altering the beam energy, and the amount of dopant can be controlled by altering the beam current and time of exposure. 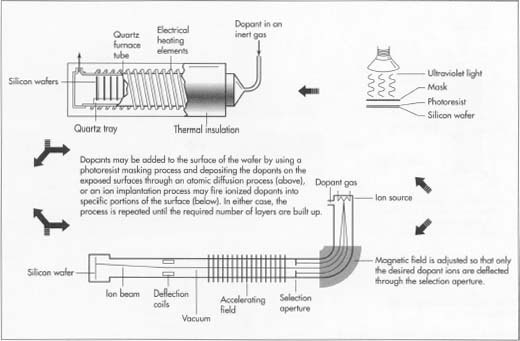 Schematically, the whole process resembles firing a beam in a bent cathode-ray tube. This method is so precise, it does not require masking—it just points and shoots the dopant where it is needed. However it is much slower than the atomic diffusion process. 10 The process of masking and etching or doping is repeated for each successive layer depending on the doping process used until all of the integrated circuit chips are complete. Sometimes a layer of silicon dioxide is laid down to provide an insulator between layers or components. This is done through a process known as chemical vapor deposition, in which the wafer's surface is heated to about 752°F (400°C), and a reaction between the gases silane and oxygen deposits a layer of silicon dioxide. A final silicon dioxide layer seals the surface, a final etching opens up contact points, and a layer of aluminum is deposited to make the contact pads. At this point, the individual ICs are tested for electrical function. 11 The thin wafer is like a piece of glass. The hundreds of individual chips are separated by scoring a crosshatch of lines with a fine diamond cutter and then putting the wafer under stress to cause each chip to separate. Those ICs that failed the electrical test are discarded. Inspection under a microscope reveals other ICs that were damaged by the separation process, and these are also discarded. 12 The good ICs are individually bonded into their mounting package and the thin wire leads are connected by either ultrasonic bonding or thermocompression. The mounting package is marked with identifying part numbers and other information. 13 The completed integrated circuits are sealed in anti-static plastic bags to be stored or shipped to the end user. Despite the controlled environment and use of precision tools, a high number of integrated circuit chips are rejected. Although the percentage of reject chips has steadily dropped over the years, the task of making an interwoven lattice of microscopic circuits and components is still difficult, and a certain amount of rejects are inevitable. The dopants gallium and arsenic, among others, are toxic substances and their storage, use, and disposal must be tightly controlled. Because integrated circuit chips are so versatile, a significant recycling industry has sprung up. Many ICs and other electronic components are removed from otherwise obsolete equipment, tested, and resold for use in other devices. It is difficult to tell with any certainty what the future holds for the integrated circuit. Changes in technology since the device's invention have been rapid, but evolutionary. Many changes have been made in the architecture, or circuit layout, on a chip, but the integrated circuit still remains a silicon-based design. The next major leap in the advancement of electronic devices, if such a leap is to come, may involve an entirely new circuit technology. Better devices than the very best microprocessor have always been known to be possible. The human brain, for example, processes information much more efficiently than any computer, and some futurists have speculated that the next generation of processor circuits will be biological, rather than mineral. At this point, such matters are the stuff of fiction. There are no immediate signs that the integrated circuit is in any danger of extinction. Braithwaite, Nicholas and Graham Weaver, Eds. Electronic Materials. Butterworths, 1990. Gibilisco, Stan. International Encyclopedia of Integrated Circuits, 2nd ed. Tab Books, a Division of McGraw-Hill, 1992. Spinks, Brian. Introduction to Integrated-Circuit Layout. Prentice-Hall, 1985. Faggin, Federico. "The Birth of the Microprocessor." Byte, March 1992, pp. 145-50. Smith, Gina. "Field Guide to CPUs." PC/Computing, March 1993, pp. 123-30.